The Workwise team - a partnership between St Mungo’s and Lambeth Housing Services - recently produced their third Annual Report on the employment support project for residents affected by Universal Credit. Again very impressive training and job outcomes were achieved with residents, many of whom have not been in employment for some time because of their circumstances. The project has also ensured residents maintain their tenancies with a 100% record for those engaging with the project. A copy of the annual report is available here. 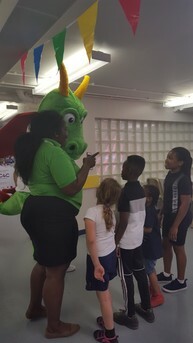 Southwyck House TRA organised a very well attended event on Saturday 14 July when over 70 residents dropped into the newly refurbished community hub to identify their priorities for activities over the next year. 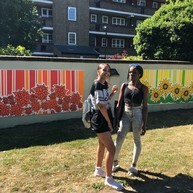 Meanwhile on Vauxhall Gardens Estate murals commissioned by VGETRA, with help from Cool It Art and local young people, have now been installed at Bromfield Park by Mears. The fantastic work has considerably brightened up the area as you can see! All three Area Boards are meeting this month for the third time. They will scrutinise the quarterly performance reports that are published every month and make recommendations for service reviews. The first Homeowners Assembly took place on 5 July. 35 residents attended workshops run by Leasehold Advisory Service and Lambeth's home ownership services. The annual Residents Assembly is being planned for Saturday 29 September. All TRAs and Lambeth 500+ members will receive an invite. If you are interested in getting involved ineither the Area Boards or the Residents Assembly please contact Erin Healy on 0207 926 8299 or email gettinginvolved@lambeth.gov.uk. GDPR became law 25 May and TRAs may have been concerned about the implications for them. It's only an issue if you have residents names and addresses. You must keep this information safety stored and must not pass it onto anyone else unless the resident has given you explicit permission to. Residents also have the right to know what information you have on them. You should not keep residents information if you don’t need to, such as old questionnaires for example. If you are collecting residents details in future make sure you have got their explicit consent and they are clear on why you are asking for their information. The getting involved grants programme is still available to TRAs who want to provide activities for their community. So far this year we have funded summer youth programmes, football practice, exercise classes and fundays. Contact your Resident Participation Officer (RPO) for more information or the engagement team at gettinginvolved@lambeth.gov.uk. The next Level 2 Food Hygiene course will be held on 28 September at High Trees 10am to 3pm. We are encouraging all TRAs who provide refreshments to undertake the training. We are also enrolling residents for the next Level 2 Scrutiny course. So far 30 residents have undertaken the course and, although hard work, have thoroughly enjoyed it. Please contact High Trees on 020 8671 3132 or email mohammed.meho@High-trees.org to enrol. The Lambeth 500+ is our online platform for residents to have their say on our policies and procedures in areas that interest them. Currently homeowner members are being asked about the communications being used for the actual service charge bills. All residents can join and you can sign up here. We are always trying to find better and cheaper ways of letting you know about what is happening in Lambeth. This is why we would like you to go to lambeth.gov.uk/updates and sign up to receive email updates on the issues that matter to you. This service is provided to you at no charge by Lambeth Council.